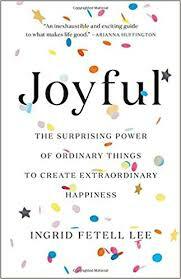 I stumbled on Joyful at an airport bookstore, and I'm delighted I did. There are so many overlooked opportunities for joy right at our fingertips. And it's all backed by extensive Ingrid Fetel Lee's extensive research. They don't require tons of time or money, just a willingness to design the environments that make up your life deliberately. You have a whole world of joy right at your fingertips. There's no method you need to learn, no discipline you need to impose on yourself. The only requirement is what you already have: openness to discovering the joy that surrounds you. Energy animates matter. It is the currency of life, transforming inert material into breathing, beating organisms. Simply to be alive is vibrate with an essential dynamism. The liveliest places and objects all have one thing in common: bright, vivid, color. Color is energy made visible. It activates an ancient circuit that lights up with pleasure at the idea of finding something sweet to eat. We dismiss color and joy as childish and frivolous, prizing neutral hues as a mark of coolness and mature taste.... The message is clear: to be worthy of society's approbation, we must outgrow our natural inclinations toward joy or learn to suppress them. Every sight we find joyful, from a sunrise to a baby's face, we owe to light reflected from the environment into our eyes. Light is color's power supply. Noticing color and light has changed the world around me. Bright hues in the cityscape, found on street signs and bike lanes, window boxes and graffiti, have become little gifts for me- small infusions of warmth and life. Energy gives you the power to make your own hearth, your own sun. Our brain can't develop in isolation; it requires a constant dialogue with the environment, particularly one with an abundance of textures, colors, and shapes. Abundance isn't just about accumulating things It's about surrounding yourself with a rich palette of textures that enliven your senses. Joy thrives on the alleviation of constraints. The delicious stretch you feel in your legs on stepping out of the car at a rest stop after many hours of driving is a joyful freedom. So is sleeping under the stars, riding in a convertible, and skinny-dipping, feeling cool water against bare skin. Views of natural settings let the eyes rest and refocus between periods of staring at screens or work materials and have what researchers call "micro-restorative effect" on our minds, relieving fatigue and refreshing our ability to concentrate. Untamed and untempered by civilization, the wilderness gives us a reprieve not only from the hard boundaries and enclosed spaces of the built environment but also from the intangible constraints of modern life. No matter how domesticated we have become, we all have a wild soul that beats and breathes under layers of clothing and responsibility. The joy of order comes in large measure from what it opposes: chaos and disorder. Order isn't dull and and staid. It's a tangible manifestation of vibrant harmony of disparate parts working concert to sustain the graceful balance of life. Harmony offers visible evidence that someone cares enough about a place to invest energy in it. Disorder has the opposite effect. Disorderly environments have been linked to feelings of powerlessness, fear, anxiety, and depression, and they exert subtle , negative influence on people's behavior. One reason we we love symmetry may be that it is an outward symbol of inner harmony. Whether sonic or visual, patterns are a timeless source of joy. One of the reasons we love patterns and rhythms is that their structured repetition of elements quickly establishes a baseline of harmony. Patterns enable us to experience an abundance of sensation without it feeling overwhelming, and they create an orderly background against which we can detect when something is out of place or awry. By removing the obstacles in our surroundings, we open up channels for the smooth flow of energy into our lives. If your environment makes you feel stable, balanced, and grounded, you're more likely to feel confident taking measured risks and exploring new opportunities. Other people may notice your calm, unhurried demeanor and be drawn to you. The only metric of success for play is how much joy it produces. Play can be profoundly liberating, but it can also make us feel vulnerable. It breaks routines and exposes us to the unpredictable. A circular or elliptical coffee table changes a living room from a space for sedate, restrained interactions to a lively center for conversation and impromptu games. The shape of our built environment is defined by choices that are hundreds, if not thousands, of years old. As these choices solidified our buildings and roads into a rigid, angular grid, they took us further and further from curving, undulating landscape within which we developed. Joy has a show showing up when we least expect it. As we move through the stream of daily life, tiny moments can capture our attention and our thoughts in a joyful direction. These moments can be especially powerful in times of stress or sadness. Joyful surprises bring our attention away from ourselves and back out into the world, prompting us to approach and engage. They incite curiosity, spur exploration and increase the chances we'll interact with others in ways that keep the positive vibes flowing. The moment that something captures we our attention, we cease to become detached from it. We see it, engage with it, and perhaps we become involved. The danger of hedonic adaptation is that it sparks a kind of desperate materialism. Hungry for novelty, we often throw out functioning objects that have lost their luster and replace them with shiny new versions. By restoring a sense of whimsy and unpredictability to our surroundings, small bursts of surprise also change our relationship to the world as a whole. Surprise destabilizes us a little, just enough to introduce a new idea or different perspective. Research has found that gaining elevation can lead us to focus more on the big picture and less on the details of the situation. engages two networks of the brain whose functions were once thought to oppose each other: the default mode network, which is involved in internally focused, self-generated thought, and the "executive network", which is recruited when we tackle demanding tasks or pursue an external goal. Glimpses of transcendence are vitial in giving our lives meaning and purpose, yet with the decline of religious belief in Western Society, we have seen the ebb of structures and rituals that traditionally provided these moments. Transcendence detaches us from the world, lifting us up above the currents and eddies of our routines. Yet paradoxically, instead of distancing us from what we care about, it seems to bring us closer. Closer to others, closer to what feels truly important, closer, even, to ourselves. Wonder overlaps with awe and both emotions elicit a similar wild-eyed, jaw-dropped expression. But unlike awe, which has both positive and negative strains, wonder is nearly always used to describe a joyous feeling. It often arises when we find ourselves in new surroundings, which helps explain why travel can be so magical and why childhood prompts such a blurring between magic and real life. Magic can be captivating, sparkling, and sublime. But what makes it so compelling is that it ruptures the membrane between possible and impossible, igniting our curiosity about the world we live in. Wonders never cease, as long as we are willing to look for them. Celebrations mark the pinnacles of joy in our lives. We celebrate marriages and partnerships, victories and harvests, growth and new beginnings. What makes celebration unique is that is a distinctly social form of joy. Research shows that celebrating positive events with others increases our feelings that they will be there for us if we encounter tough times in the future. Many celebratory occasions have been reduced to a Facebook post, reading "Congrats" or "Happy Birthday" - accented by champagne and confetti emjojis if the sender isn't too late for a meeting. In the crush of balancing work and family life, and with the simulacrum of connection provided by social media, its' easy for people to let opportunities for celebration slip unheeded. Finding happiness isn't a matter of creating a perfectly even keeled experience of the world, where no sadness every intrudes. Instead it means riding the the waves of joy, and trying to find our way back upward when we've been knocked down.